Silver Lake today. The original Silver Lake, known as “Diana’s Pool” in the 1930s, was the deeper area on the other side of the rock jetty. Silver Lake is one of the most beautiful and enchanting hidden gems in Westchester County. Every summer hundreds of families trek down the steep pathway to the beach, spending time on the sand, basking in the sun, being refreshed in the cool waters of the Croton River and relaxing in a very special, secluded world. Those who have experienced it come away with the feeling of having been in a unique spot—something you never forget because it leaves such a wonderful memory. What about its early history? In the 1930s the area was known as “Diana’s Pool.” This spot is on the other side of the rock jetty at today’s Silver Lake, where the river is wider and deeper. This detail from a 1935 Westchester parks map, shows the attractions at Croton Point Park, which included a landing area for seaplanes. According to former neighbor Ed Rondthaler, young people would gather at Diana’s Pool, and also down around today’s Mayo Landing, for nighttime swimming, singing, poetry reading and drinking. In 1934 the owners of the land around Truesdale Drive had prohibited parking along the street because officials asserted that local bathers were “making a nuisance of themselves,” so people parked up near Quaker Bridge and walked down a narrow dirt trail along the river. Trouble developed one Sunday afternoon when “festive devotees of Bacchus,” the Roman god of wine, “desecrated the sylvan pool consecrated to chaste Diana.” Troopers were called to order people to move from Quaker Bridge Road where they had parked. Miss Mayo warned that future problems would result in the property being thoroughly posted and all persons prohibited from swimming in the Croton River. Actress and playwright, Margaret Mayo in 1898. In the fall of 1936, Miss Mayo made a proposition to the Village Board to allow access to her land around Diana’s Pool, provided that the village assume all responsibility and station someone to guard against accidents. Ultimately, with the cooperation of Miss Mayo, as well as the Harmon Realty Company, the Village purchased the property and Silver Lake was secured for Croton residents. In May 1938, the Village Board hired a lifeguard for the summer season, installed sanitary conveniences, and made provisions for parking. The beach was limited to Croton residents and was financed by charging a nominal fee, $1 per family per season. Bathing suit emblems for families and guests were distributed. If a family had additional guests beyond the four allowed at one time, there was a charge of 10 cents per guest. Stickers to identify cars were also given out. A news article in June 1938 announced, “Swimming pool to be opened on July 1.” And so it was that Silver Lake became a treasured piece of the Croton community. In 1943, with World War II in full swing, the village was hard-pressed to find qualified lifeguards since most able-bodied males were doing more important guard duty for Uncle Sam. Nonetheless, the natural charm of Silver Lake was enhanced by adding a slide, picnic tables, a horseshoe court, rafts, campfires and swimming meets. When the war was over, a group of citizens approached the Village Board asking that the name Silver Lake be changed, and a monument be placed at the park entrance, so that no one could enter without being reminded of those who gave their lives that the nation might remain free. The Board declined to take any action on the proposal. That summer also saw the addition of a diving board, diving tower, large float and rope swing (all located on the other side of the present stone jetty), swimming lessons, dressing rooms, and supervision by three lifeguards. Year-round recreation! An impromptu hockey game on a frozen Silver Lake in 1949. In August that year Westchester County issued an ultimatum, telling Croton that it would have to install flush or chemical toilets, or close Silver Lake; pit privies were no longer permitted. Toilets were installed, picnic tables and fireplaces added, drinking water supplied, sharp stones were removed from the swimming area, a new fieldstone dam was built at the lower end of the pool, and an artesian well pumping system set up to insure adequate water for swimming during droughts. The year 1951 brought the Hudson Valley Recreation Association Swimming Meet to Silver Lake with teams throughout the county participating. Races were held in lanes, marked with floats, above the stone jetty in the deepest part of the river. The site also hosted a fishing rodeo for children that year. In 1952 a drought occurred, and although the artesian well pumping system had been installed, it was not yet operational. 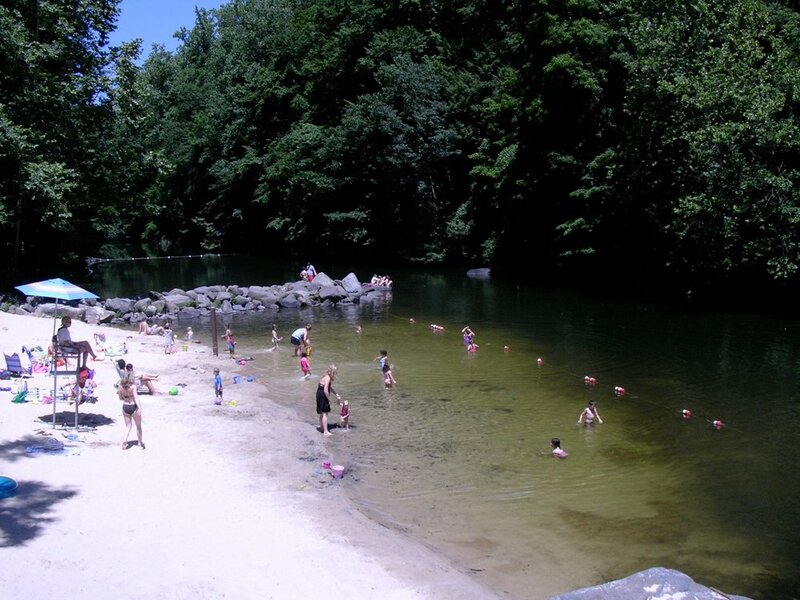 Officials looked into using a fire pumper and hose to bring water upstream from the spring-fed pools at Fireman’s Island but due to politics and budget restraints, the fire pumper proposal was not activated. Water levels continued to go down through August. This was the beginning of more than a decade of problems with the unreliable water supply and spurred a variety of attempts at a solution. The issue also caused some in the village to question whether the expense of maintaining Silver Lake was worth it and whether a manmade swimming pool should be built instead. This 1953 article shows Silver Lake when it was located above the rock jetty (seen on the right). By July 1955, the water level in the river was back to normal and some 4,000 people used the park in the middle of the month. But to maintain suitable water levels, the Village was running water into the river from a fire hydrant located on Truesdale Drive. The beach area of today’s Silver Lake, shown in the 1950s before construction of the dam. The raft on the beach was usually anchored in middle of the river for the safety of swimmers. In 1956 fifty loads of sand had been spread over an enlarged beach and on the first day of the season, 600 people converged on the park to escape the summer heat. But in August, a near catastrophe occurred when New York City released, unannounced, a large quantity of water from the bottom of the New Croton Dam. The flood descended one afternoon, causing water levels to rise five feet in five minutes, imperiling children, submerging equipment, washing away sand, and terminating swimming for that summer. The City explained that blow-off gates at the dam had been activated to reduce the water level in the reservoir so the dam could be examined for possible leakage as flooding had occurred at the dam the year before. Crotonites save a diving board from being washed down stream when New York City released water from the dam without warning. New York City continued to drain the reservoir to repair cracks in the dam, resulting in little or no water flowing downstream in 1956 and 1957. Silver Lake became a useless muddy crater, so the Village conducted borings to determine if the bottom of the Croton River in that area would hold water and also whether there was water underground that could be pumped to keep the lake filled. The test borings showed promising sub-surface geology, with underground water starting to show up at about thirty feet. This would make it possible to install a permanent sheet metal and masonry dam at the lower section of Silver Lake and create a permanent swimming area. Prior to that a small artificial channel with a gate had been fashioned from the end of the stone jetty across to the far side of the swimming area to assist in controlling water flow. In the early 1960s a court case solved the problem of keeping the water flowing into Silver Lake. The Hudson River Fishermen’s Association (a group that became Riverkeeper in 1986) won a lawsuit asking that New York City be required to release enough water into the Croton River to support the rainbow and brown trout nursery. A byproduct of this important court decision was that Silver Lake would have a constant flow of water, except in the most extreme drought conditions. The river below Croton Dam is still a sensitive nature area today. The New York State Department of Environmental Conservation releases baby brown and rainbow trout into the Croton River each spring. In the years prior to the court decision the Village Board and Recreation Commission grappled with the issue of building a new community swimming pool rather than continuing to operate Silver Lake. Those arguing in favor of a new pool pointed out that it would be impractical to spend a lot of public funds on improving Silver Lake since water levels could never be guaranteed. Wells that might be built at Silver Lake could run dry in a few years, parking was a problem, and it was located at the bottom of a steep hill. A new pool, they claimed, would always have ample clean water, a daily filtering system, easier supervision, could be used by schools for instruction and competition, and would contain no dangerous underwater rocks. An L-shaped pool, wading pool, bathhouse with dressing rooms and lavatories, check room, and first aid area was projected to cost about $150,000. By November 1960 the Village Board had completed a study of the benefits from building a new pool. Possible sites included the area between Batten Road and Route 129, area between Wells Avenue and Grand Street, and the Duck Pond at Riverside Avenue. An opposing group called the Committee for Silver Lake, with hundreds of backers, campaigned to develop the existing site on the river. They offered a plan to create a more beautiful, healthful and reliable swimming area by building a new dam, an enlarged beach area, a protected wading area for children, adequate parking, bathhouse facilities, and a park atmosphere that Robert Moses would be proud of. Enlarging the current park by means of a new dam, they argued, would create a recreation area six times the size of the pool proposed by the Village Board. A 1962 editorial cartoon during the controversy over the future of Silver Lake. In early 1961 the Village Board announced an upcoming vote on the improvement plans for Silver Lake. Rumors abounded that the majority would vote against the proposal. The group Citizens and Children for Silver Lake promised to march on the Municipal Building, carrying torches and banners, and attend the meeting in force. Leaflets reading “Save Silver Lake” were distributed throughout the village. After much controversy the Board voted in favor of improving Silver Lake and passing a bond issue to raise funds for the development. The arguments between Village Board and Recreation Commission were put to rest, the Board announcing that it would not interfere with the Commission’s role concerning Silver Lake. The Recreation group would run the parks and the Village Board would run the village government. On the first day of swimming in June that year, some 300 residents enjoyed a Silver Lake that had been significantly improved since March. The new dam still needed to be constructed and the Ottaviano Corporation was awarded the contract. The cost was $35,000 and would include removing the existing upriver sluice dam and cleaning the river bed. Construction of the dam at Silver Lake in 1961. Construction began in September 1961, with the arrival of a bulldozer that cleared the upstream river bed and moved stones into the beach area to make a natural retaining wall and breakwater. Sheet metal piles were driven to support a new dam. The entire project was completed by November. The dam built that year held up remarkably well, but in fall 2010 the village undertook a major construction project to rebuild it. Much of the original dam was underwater. Concrete had eroded and parts of the metal cap across the top had washed away, creating a potential safety issue for swimmers. The repair project cost approximately $200,000, which included building a coffer dam to divert water away during construction and a new metal cap. Construction starts on the new dam in 2011. The pipe in the water at the bottom of the photo was used to pump water up to Silver Lake during periods of drought in the 1950s.